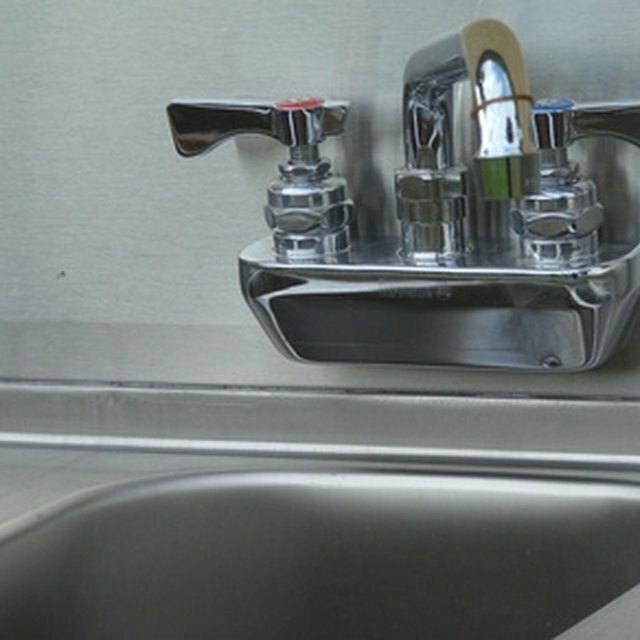 Sinks come in a variety of shapes and sizes and can be manufactured from a variety of materials. Just as every material has its pros and cons, drain layouts for sinks have advantages and disadvantages. When choosing between sinks with off-center or centered drains, there are a few things to keep in mind. Double sinks in kitchens often have centered drains. Generally speaking, a sink with a centered drain will drain faster than one with an off-centered drain, which makes sense when you consider how much further water has to travel from the far side of the sink, away from the drain, to the drain in each layout. In a sink with an off-centered drain, this length is the diagonal length of the sink. In a sink with a center drain, this is at most one-half of the diagonal length of the sink. One problem with centered drain sinks becomes apparent when washing dishes. Scrubbing a large pot or pan while it lays flat on the base of the sink, presents two problems. First, the water will not drain as the pot or pan is blocking the drain opening. Second, you are putting additional stress on the drain by pressing down on the pot or pan to scrub, which can, over time, break the seal of the drain and cause a leak. If you examine the area underneath a sink with an off-centered drain, you will quickly notice one advantage. The off-centered drain is tucked in the back of the sink, giving more room for storage under the sink itself. In a centered drain style sink, the drain comes down right in the middle of your under-sink cabinets, which is even more apparent in double sinks with centered drains. The consequence of having a drain that is tucked in the back of your under-sink cabinet and is not taking up space is apparent during installation and repairs. The drain is located far in the back of the cabinet and can be difficult to install and equally difficult to repair or replace. Can You Replace Metal Around Sink Drains?